For government agencies, performing FOIA requests can involve multiple employees each devoting hours of manual effort to complete a search and still missing critical files. How could better email management improve this process? Within US federal government agencies, records and information management is an integral part of everyday work. They must comply with memorandums and directives for record classification and retention. This is in part to enable them to respond to the constant stream of Freedom of Information Act (FOIA) requests that many Federal agencies receive. When a FOIA request is received, the agency must be able to produce all records pertaining to the issue in question. Many of these are email records. Complying with National Archives and Records Administration (NARA) recommendations represents a significant step forward in records management practices for many US federal agencies today, where the practice in many departments is to print emails and then store them as paper records. While reliable, this method is slow and cumbersome and consumes numerous person-hours at significant expense. All government agencies have been challenged in the governance of email records since the issuance of the Managing Government Records Directive, M-12-18 addressing the heads of all executive departments, agencies, and independent agencies. The overarching message of the directive references the 2012 Presidential Memorandum, “Managing Government Records“, states the government’s objective of “Improving records management [to] improve performance and promote openness and accountability by better documenting agency actions and decisions. For most government organizations, a natural step in recent records compliance has meant tasking employees with setting up specific folders in their archive inboxes in which they store records—embedded in Outlook PST files. Time consuming searches impacting multiple employees. FOIA requests can involve multiple employees and include an electronic search of various share drives, personal drives and email, as well as of paper files in desks, file cabinets around the office, and file rooms. The requests usually have a short turnaround time and almost always interrupted the employees’ regular work and can be curtailed when people are out of office. Error-prone searches overlook critical files. By maintaining emails in PST files, no additional metadata is captured to facilitate searches. Only broad keywords can be used to search files then a time-consuming and subjective manual review is required to see if emails have anything to do with the FOIA request. This increased the risk that not all the pertinent records could be found. Missed files, erode public trust. There have been multiple news reports covering FOIA request responses from government departments and agencies, revealing that other searches have found records that were not previously provided. This undermines public trust in Government and is an embarrassment to senior management, who often lack a method of more accurate discovery. To accelerate and improve the accuracy of FOIA responses, and address records management requirements of M-12-18, the government agency implemented Colligo Email Manager, an Outlook plug-in that seamlessly integrates SharePoint within Outlook, to help automate email labelling and classification as part of an end-to-end records management solution provided by NEOSTEK. Simplified record capture. Now, capturing records is significantly simpler. Using Colligo Email Manager, employees easily drag and drop emails that qualify as records into a shared SharePoint folder. This same process can be used for non-email files dragged into the Outlook navigation pane. The system automatically captures some metadata, and prompts for more including content types to determine retention schedule. Rapid and accurate search capabilities. Critically, searching for records to fulfill a FOIA request is now much faster and more robust, with less chance that something will be overlooked. Information is now centralized and structured in SharePoint, meaning that a single search is all that is needed to identify appropriate records. Deployed quickly. The underlying record management processes did not need to change, and no extensive training was required. In fact, the project team asked the first tranche of end users to present to upper management to demonstrate how easy it was. 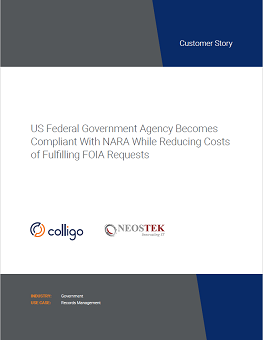 Since implementing Colligo, the Agency has dramatically reduced the time needed to respond to FOIA requests, as well as the associated cost of inefficiency. Prior to using Colligo, complex FOIA requests could involve 40 or more employees each devoting 3-5 hours to complete a search. With Colligo, a single person can perform a search in under an hour. At a rate of $150/hour, this represents a $23,850 savings for each complex request. Each year, the Agency receives over 175 complex requests, representing a savings of over $4 million per year. With NEOSTEK’s know-how and the inclusion of Colligo as a key component of a fully automated FOIA search—keeping email searchable and accessible with metadata and no burden to end users—they’ve enabled the Agency to go from multiple people working for hours on FOIA requests to a single person for one hour. Learn about other customers we’ve helped. Colligo was the missing link in providing our client with an end-to-end electronic records and information management solution. With it, we delivered! Colligo solves the problem of classifying and properly managing case-based emails while increasing user adoption. My client was extremely happy with the solution because it got the job done and was easily adopted by the end users."